For urban village in Phoenix, see Deer Valley, Phoenix. 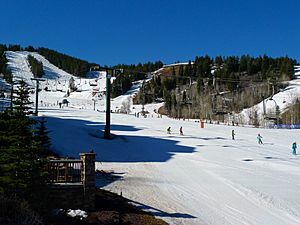 Deer Valley is an alpine ski resort in the Wasatch Range, located 36 miles (58 km) east of Salt Lake City, in Park City, Utah, United States. The resort, known for its upscale amenities, is consistently ranked among the top ski resorts in North America. Deer Valley was a venue site during 2002 Winter Olympics, hosting the freestyle moguls, aerial, and alpine slalom events. It also regularly hosts competitions for the International Ski Federation. 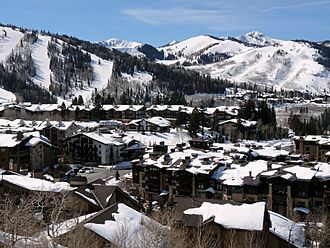 With a number of other large ski resorts nearby, Deer Valley competes by catering to a more upscale audience than its neighbors, offering amenities such as free ski valets, free parking shuttles, fine dining and boutique shopping in the main lodge. Stein Eriksen, namesake of the Stein Eriksen Lodge, is host of the mid-mountain lodging property and director of skiing at the resort. Deer Valley uses more grooming equipment than other Wasatch ski areas, and limits access to avoid overcrowding; the resort limits ticket sales to 7,500 per day. Deer Valley's total uphill lift capacity of 50,470 skiers per hour is approximately 50% higher than the capacity of each of its larger neighbors Park City Mountain Resort and the former Canyons Resort (now merged with PCMR). Deer Valley has 21 chairlifts, including 12 high speed detachable quads and an enclosed 4-passenger gondola. Skiing began at Deer Valley with the Park City Winter Carnivals of the 1930s, and the Works Progress Administration (WPA) built the first ski trails and other facilities during the winter of 1936-1937. The first ski lifts appeared in 1946, when local residents Robert Emmett Burns, Sr. and Otto Carpenter constructed them, largely from nearby lodgepole pines. The ski area was called the Snow Park Ski Area, a name which endured from 1946 to 1969. In 1981 Edgar Stern founded Deer Valley Resort in the same area and above. It has grown to include six mountains with six bowls, 930 acres (380 ha) of glade skiing and 670 acres (270 ha) of snow-making. The resort totals 2,026 acres (820 ha) in size. Deer Valley opened in 1981 on Bald Eagle and Bald Mountains, with five lifts built by Lift Engineering, also known as Yan: the Burns double (which is the only remaining original lift on the mountain), and the Carpenter, Homestake, Sultan, and Wasatch triple chairs. The Sterling lift was added in 1982, followed by Clipper in 1983. The first major terrain expansion came in 1984 with the addition of the Mayflower lift on Bald Mountain. In 1991, Deer Valley's first high speed quad, Carpenter Express, was installed on Bald Eagle Mountain. That same year, the resort expanded onto Flagstaff Mountain with the Red Cloud and Viking lifts. This area added new intermediate and advanced mogul runs. The Crown Point lift was also built. Further expansion came in 1993 with the addition of the Northside Express lift, with its popular intermediate terrain. The Snowflake beginner double was also built this year. All new Deer Valley lifts built from 1993 on have been built by Salt Lake City-based Doppelmayr CTEC and its predecessors. In 1996, the Carpenter Express and Wasatch lifts were replaced by two new Garaventa CTEC high speed quads. The old Wasatch triple was moved to create the Quincy lift in 1997. Also in 1997, the Deer Crest fixed quad was built, though it did not open until the following year. For the 1998-99 season, Deer Valley underwent a major expansion, adding two more mountains. On Little Baldy Peak, the Deer Crest lift and Jordanelle Express Gondola opened with 8 runs: 2 green, 3 blue, and 3 black. In Empire Canyon, the long-proposed expansion included the Empire Express high speed quad and the Ruby fixed quad. The Empire area added advanced and expert terrain, including 2 blue runs, 4 black runs, and three expert bowl areas. Deer Valley built many new lifts on its existing terrain in the early 2000s (decade). In 1999, the Homestake triple was replaced by a fixed grip quad, and the old triple was moved to Empire Canyon the following year to become Little Chief (which itself was removed in 2009). In 2000, Silver Lake Express replaced the Clipper triple to provide a direct link between Deer Valley's two lodges. Quincy and Ruby were replaced by high speed quads in 2001 and 2002, respectively. In 2004, the Silver Strike Express and Judge lifts were built on Flagstaff Mountain. Sultan Express replaced the original Sultan lift in 2005. Sterling was upgraded and extended in 2006. The Deer Crest chairlift was upgraded from fixed grip to a high speed quad and renamed The Mountaineer Express in 2012. On October 3, 2014, Deer Valley Resort announced that it had entered into an agreement to buy Solitude Mountain Resort and took over operations on May 1, 2015. Deer Valley was one of the first resorts to offer ski valets to carry guests' ski gear, free parking-lot shuttles, and a state-licensed child-care facility, and to uniform all its employees. It also provides tissues in the lift lines, refers to customers as “guests”, and provides complimentary overnight ski check services. 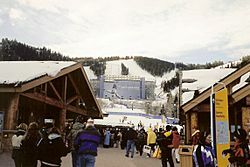 During the 2002 games Deer Valley hosted the freestyle moguls and aerials, and alpine men's and women's slalom events. Three of the resort's runs were used during the games including Champion (site of freestyle moguls), Know You Don't (site of alpine slalom), and White Owl (site of freestyle aerials). Temporary spectator stadiums were located at the end of each run, they were 12-stories tall and included seating for 10,000 people, while spectator standing areas were located along the sides of each course; the standing areas and stadium combined allowed roughly 13,300 spectators to view each event. 99.4 percent of available tickets for events at the venue were sold, which totaled 96,980 spectators witnessing competitions at the resort. During the games 95 percent of Deer Valley remained open to the public for normal seasonal operations. The resort hosted the 2003 and the 2011 FIS Freestyle World Ski Championships, becoming the first American venue to host twice. 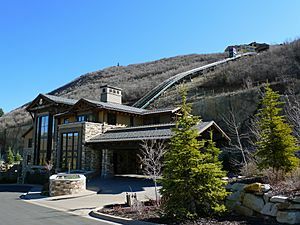 Deer Valley is a regular host to FIS World Cup events, having hosted men's and women's mogul and aerial competitions yearly since 2000 (with the exceptions of 2003 and 2004). The resort also hosted a skicross event in 2008, and is scheduled to host a World Cup event every year through 2019. Deer Valley's track record of event hosting has led it to be described as "a Mecca for freestyle skiing events". Deer Valley was ranked third overall in SKI magazine's 2015 and 2016 reader resort surveys and was second in 2012, 2013, and 2014. The resort was ranked first for five consecutive years between 2007 and 2011; in the history of the survey no other resort has been ranked first for more than three consecutive years. In the 2016 survey, the resort received first place ratings in the categories of grooming, service, access, on-mountain food, lodging, dining, and kid friendliness. In addition, Deer Valley has received top 10 ratings in the categories of snow, lifts, weather, apres-ski, off-hill activities, and overall satisfaction. At the inaugural World Ski Awards, Deer Valley won the award for best ski resort in the United States for 2013. The Goldener Hirsch Inn, located at Deer Valley's Silver Lake base, was given the award for best United States ski boutique hotel and Casa Nova, located in the resort's Deer Crest area, was named best United States ski chalet. Deer Valley was again awarded best ski resort in the United States in 2014 by the World Ski Awards. Deer Valley's Mariposa at Silver Lake has been rated the #1 restaurant in Utah by the Zagat Restaurant Guide. Deer Valley is one of three remaining American ski resorts that prohibit snowboarders along with Alta and Mad River Glen. The resort has occasionally been the subject of protests and poaching by snowboarders such as when snowboard manufacturer Burton Snowboards offered $5,000 for video footage of riders snowboarding at Alta, Deer Valley or Mad River Glen in late 2007. According to Burton's website, the point of their campaign was that such discrimination displays a "blatant aggressive disregard" for the Constitution of the United States. Snowboarders living in or visiting the Park City area can snowboard at Park City Mountain Resort while also offering halfpipes and other terrain park features. This climatic region is typified by large seasonal temperature differences, with warm to hot (and often humid) summers and cold (sometimes severely cold) winters. According to the Köppen Climate Classification system, Deer Valley has a humid continental climate, abbreviated "Dfb" on climate maps. Terrain Aspects: North 45%, South 2%, East 45%, West 8%. Deer Valley Facts for Kids. Kiddle Encyclopedia.